Has your child seen a ladybug? 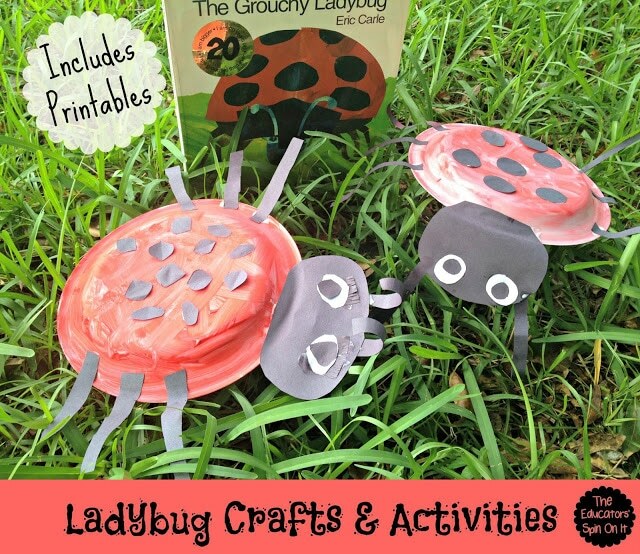 Here’s a playful way to engage with ladybugs and ladybug themed books for your child. 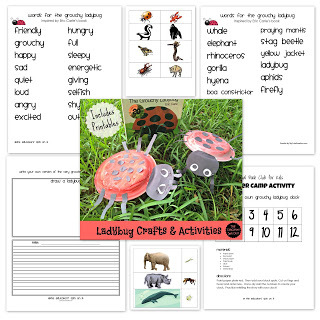 Plus some printables to sneak a little learning into your ladybug fun. I’m sharing with you 4 Ladybug Themed Activities that work well for siblings to do together! We’ll create a Ladybug Puppet for Retelling the Story, a Ladybug Clock, a Ladybug Story, and Ladybug Animals Cards Game for Retelling! Let’s get started! Have your child paint the Paper Plate Red. While glue is drying create the black spots to glue onto the ladybug. For older children have then cut out their own circles. Also cut 6 legs to glue onto the body. Then cut out an oval for the ladybug’s head. Use googly eyes or create your own eyes using white paper and black paper. Dont’ forget to add your antennae! The more original the better for each child! You can attach it to a stick or place a paper across the bag so your child can hold it easier to crate a puppet. 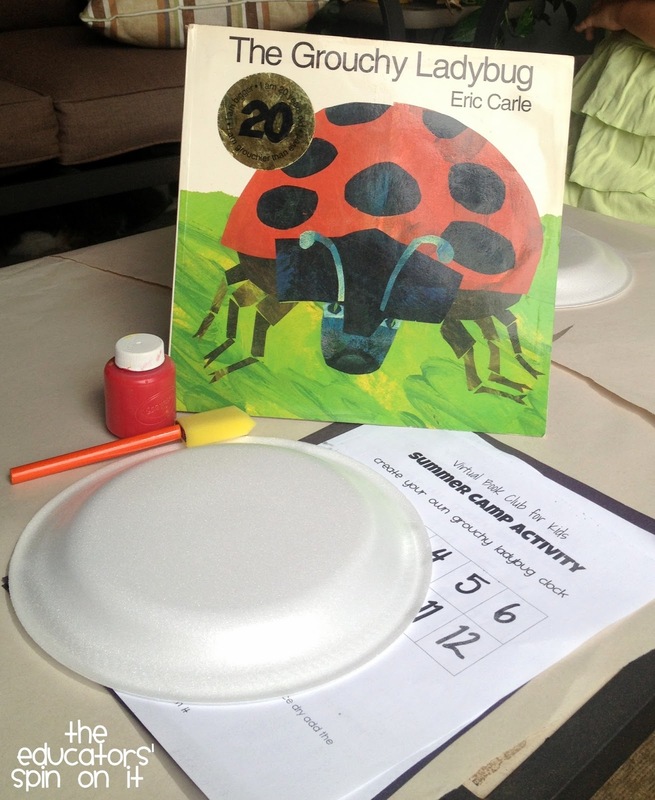 Now you’ve created your very own Ladybug Puppet to Retell the story! Have a little extra paint red paint? 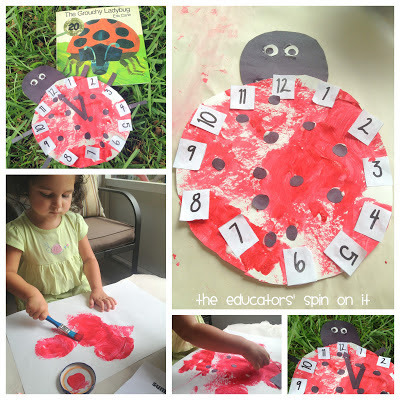 We cut out ladybug bodies to create our own Ladybug Clocks to go along with the story too! I loved that both of these activities kept my 2 year old and my almost 7 year old interested and having fun together. Paint the paper red and then cut out the circle for the clock. Then create while paint is drying create the black spots and head with black paper. You can also print off your clock numbers and cut then out together. For my youngest, age 2, I helped with the glue but we counted the numbers together. For my oldest, age 6, she created hers all on her own and then reused the clock to retell the story. We just made the clock arms out of black paper too and moved around. If you have brads that works great to attach but honestly it’s not necessary. What would a happy Ladybug say? What would an excited Ladybug say? What would a shy ladybug say?